Newly named St. Joseph’s University President Mark C. Reed. St. Joseph’s University’s board of directors has elected Mark C. Reed as the university’s new president, it was announced April 22. He is the first lay person to lead the Jesuit-run university in its 164-year history. 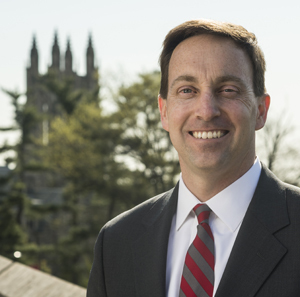 Currently senior vice president and chief of staff at Fairfield University in Connecticut, the Philadelphia-born Reed is a 1992 graduate of St. Joseph’s Preparatory School who also earned his doctorate in education at the University of Pennsylvania in 2008. He had earlier earned undergraduate and advanced degrees from Boston College and from Fairfield, where he also is also an adjunct mathematics professor. The appointment becomes effective July 1 and will be announced today at St. Joseph’s Cardinal John P. Foley Campus Center. During his 15-year career at Fairfield and prior to his current position as senior vice president and chief of staff, Reed served as the university’s interim vice president for university advancement; vice president for administration and student affairs; vice president for student affairs; associate vice president and dean of students; and dean of students. He is a past president of the Jesuit Student Affairs Association and recently received Fairfield’s Distinguished Faculty/Administrator Award. At Fairfield — one of 28 colleges in the United States sponsored by Jesuit priests — Reed leads the university’s largest non-academic division. As the principal adviser to Fairfield president Father Jeffrey P. von Arx, S.J., he is the senior officer of the university and its leadership team, and has been responsible for the execution of multiple strategic plan initiatives. He has also directly solicited and received funding commitments including a recent $10 million gift to expand and modernize the campus recreation complex. Preceding his career in higher education, Reed worked as a teacher and administrator in Catholic secondary education. He and his wife Kate and their two young daughters will be relocating to the Philadelphia area this summer.